The global landscape for fighting tax evasion and avoidance has changed substantially over the last few years. International cooperation and exchange of information (EOI) have emerged as vital tools in tackling illicit financial flows (IFFs). Countries that are destinations for these flows, including financial centres in Europe, Asia, America, the Caribbean and Pacific, now participate in the global effort to improve tax transparency and EOI for tax purposes thus helping developing countries to prevent the outflows and identify the people involved. The recent report from the African Union and United Nations Economic Commission for Africa’s High Level Panel on Illicit Financial Flows from Africa has focused attention on the scale of IFFs from Africa. It estimated that Africa loses $50 to $60 billion each year through IFFs. This includes money from tax evasion and other criminal activities (corruption, money laundering, etc.) which undermine Africa’s development and governance agenda. The report also identifies ways to tackle IFFs, including through EOI and improved international tax cooperation. Only 27 African countries (i.e. half of them) participate in the international work on tax transparency and EOI and only five are participating in automatic exchange of information (AEOI). Many African countries lack of an appropriate legal framework, or the administrative organisation and processes needed to use EOI effectively and benefit from tax cooperation in their domestic revenue mobilisation efforts. What is needed is to address these obstacles by mobilising political backing for this agenda in Africa with the support from the global tax community. 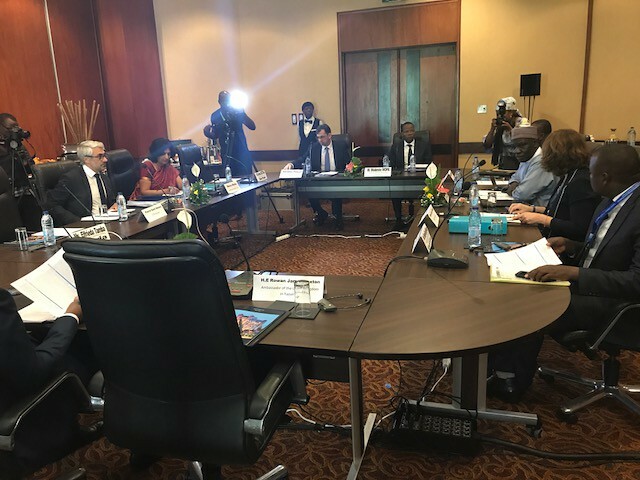 The Yaoundé Declaration marks the beginning of the next stage in the effort to improve international tax cooperation to fight IFFs in Africa. Following the Yaoundé Declaration, African Ministers of Finance, Economy and Integration have called upon the African Union “to lead in the tax transparency and information exchange agenda for Africa, and foster stronger collaboration among countries and regions to stem illicit flows and enhance domestic resource mobilization on the continent”. This was a key message of the Declaration released at the Ministerial segment of the 2nd AU Specialized Technical Committee (STC) on Finance, Monetary Affairs, Economic Planning and Integration held in Addis-Ababa on 16-17 April 2018. The report of the outcomes of the STC will be submitted for consideration at the AU Assembly of Heads of State and Government in June 2018. What is the Yaoundé Declaration?